No director is attached at this time, and the news is quite intriguing, given the nature of the Snake Eyes character, who, along with being highly skilled in combat and martial arts, is also known for never speaking. Martial arts expert and actor Ray Park portrayed Snake Eyes in both Paramount's 2009 movie G.I. Joe: The Rise of Cobra and its 2013 follow-up, G.I. Joe: Reltaliation. 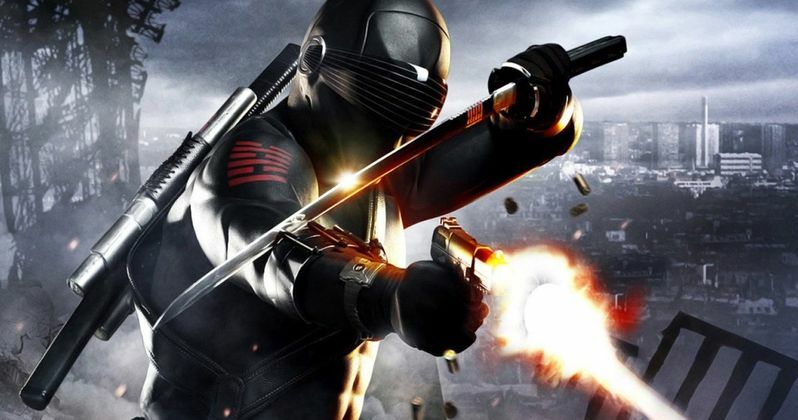 There is no indication yet that Ray Park will be brought on to reprise his role as Snake Eyes yet. Snake Eyes was one of the original G.I. Joe characters that first launched with the 1982 Hasbro toy line G.I. Joe: A Real American Hero, which later spawned two hit animated shows and a Marvel Comics series. While little is known about his background, he has a rivalry with his blood brother, a ninja known as Storm Shadow, and Snake Eyes also had a romantic relationship with another member of the team, Scarlett, who, at the time, was the team's sole female member. At times, Snake Eyes also carries out solo missions with his pet wolf, Timber. It's possible that this Snake Eyes movie could take another direction entirely. Back in November, IDW Publishing unveiled their new version of Snake Eyes, played by a female character, Dawn Moreno. This was the start of IDW's "Dawn of the Arashikage" storyline, written by Larry Hama, a legend among the G.I. Joe franchise, who wrote most of the original "file cards" that came with with the G.I. Joe: A Real American Hero toy line that launched in 1982. These comics proved to be quite popular, with the first three issues selling out at the distributor level, sparking speculation about a new Snake Eyes based on the Dawn Moreno character. Paramount put together a writers' room in 2016 for the entire Hasbro Cinematic Universe under the Allspark Pictures banner, which includes franchises such as G.I. Joe, Micronauts, Rom, M.A.S.K. and Visionaries. That writers room was lead by Akiva Goldsman, with the other writers including Michael Chabon, Brian K. Vaughn, Nicole Perlman, Lindsey Beer, Cheo Hodari Coker, John Francis Daley and Jonathan Goldstein, Joe Robert Cole, Jeff Pinkner, Nicole Riegel and Geneva Robertson-Dworet. Evan Spilotopoulos made headlines earlier this week when he was brought on to write the script for Netflix's Bright 2. His other writing credits include Beauty and the Beast, The Huntsman: Winter's War, Hercules, Battle for Terra and a number of straight-to-video animated movies. The Hollywood Reporter broke the news on this new Snake Eyes spin-off.